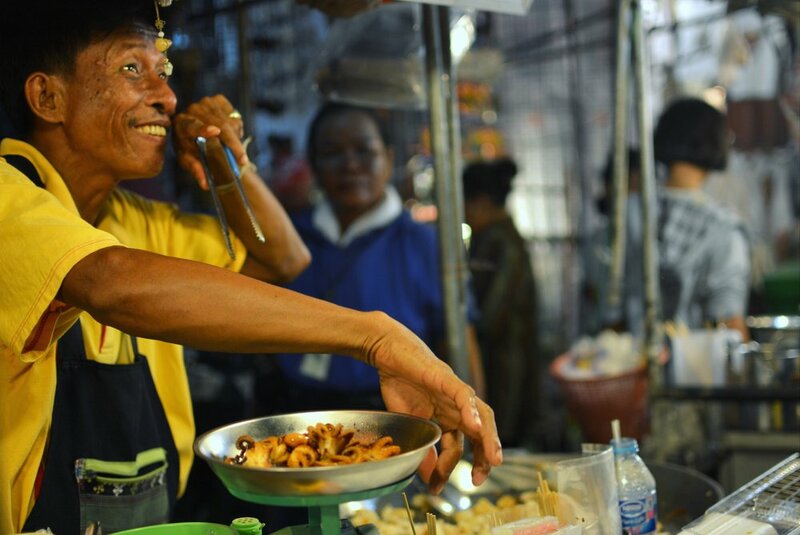 Bangkok's vibrant Street food culture from these diverse areas. Ratchada train market, Wang lang market, Or Tor Kor market, Khao San Road. Explore the city and experience local food. I really love to go Ratchada there have plenty of food stalls, many tradition foods and lots of things to taste. If there is one reason why you must visit Rot Fai Market Ratchada, it has to be the mouthwatering array of food you get there. The bazaar has rows and rows of food stalls where cooking is done right in front of you. There’s such a good variety of both street food snacks, and sit down local places serving southern Thai food to sizzling oyster omelet restaurants crammed into tight alleys.Wang Lang Market is a full Bangkok eating paradise. "Or Tor Kor Market" is one of Bangkok's best kept secrets. Due to its cleanliness, selection of high quality produce, and a jaw-dropping selection of ready-to-eat food, Or Tor Kor is not necessary the best market in Bangkok (in my opinion), but it’s certainly in a class of its own when it comes to quality. "Khao San Road" the center of the backpacking universe. In addition to being great for adjusting to the culture and climate, Khao San Road is also a great place to ease yourself into the intense sensory experience that is Thai cuisine. Restaurants, snacks and stalls on wheels, great street food (pad thai, porpia, curries) you could even try some of the outrageous snacks there, such as fried bugs! A great place for shopping, music and drinks. - With your appetite fully satisfied return to your hotel. - Overtime tour guide if hours exceed stated tour. Costs 300THB per hour per group. This tour is limited to when low tides occur at an appropriate time and is seasonal from Mid April to end of Aug. please note this not is not always available. 07:30 pick up from your hotel. Depart Bangkok in our private VIP A/C Mini van. This buzzing market is at its best in the early morning before the crowds arrive and the heat of the day builds up. Use a paddle boat to experience the floating market. (please note it depends on the tides each day whether catching shell fish activity is available). Located just south of Samut Songkhram town at the muddy mouth of the Mae Khlong River, The area’s vast and squishy sand flats reveal several other edible molluscs, including scallops, venus clams and cockles and razor clams. Don Hoi Lot’s impressive seaside market and restaurants. On weekends, a sizable stretch of coastal road is transformed into a dizzying spread of fresh and prepared seafood, packaged local products, fresh fruit, Thai sweets and a few Don Hoi Lot T-shirts for good measure. 14:00 Mae Klong Railway Market. 16.00pm Drop off at the hotel or any place you require. - Overtime tour guide and private van after 8 hours tour costs 550THB per hour per group.